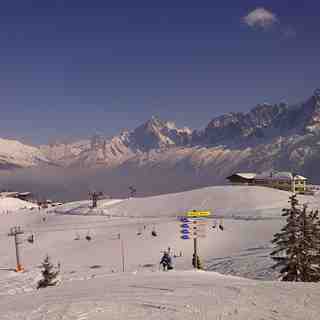 Is it snowing in Les Houches ?Merci! Les Houches is the home of the world famous Khandahar Verte des Houches Downhill ski run, hosting the Chamonix Valley leg of the World Cup circuit in early January of each year. 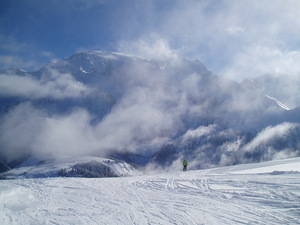 Although a rather small resort, the 47 km of runs offer a good variety of alpine skiing sweeping down through woodland on the north-western slopes of Mont Blanc, the white dome of which tower's above the ski area. A number of race clubs use Les Houches as a training ground so, understandably, the standard of skiing is generally on the high side. 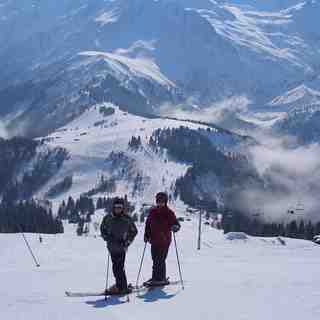 Les Houches is also the winter training base for the British Ski Academy. 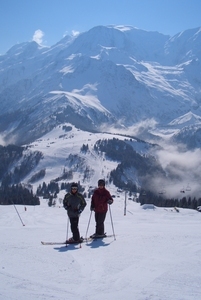 Whilst not an area large enough to consider for an exclusive trip, unless specifically for training, it is well worth paying a visit if skiing in the Chamonix valley. For Intermediates and above, with the exception of race days, you can ski the Khandahar from the 1860m summit, back to the town centre at the resorts base, uninterrupted. Les Houches is at last being managed by the Chamonix Lift Company and many changes are scheduled for next season (2012-2013) with new lifts and expanded pistes. In the meantime the two terrain parks have been closed. This gives more space for the resort's traditional use for race-training and instructor development courses. Wonderful weather at last after truly appalling conditions during the week. Snow conditions are Spring like today and the weather warm. This means a thaw-freeze cycle will set in. That means the snow will be very firm at the start of the day and soft and sticky by about lunchtime. The best policy is to get up the hill early. If the snow is too firm for you then go somewhere for coffee. The important thing is not to miss the start of conditions that you enjoy, because the snow will continue to soften until it is very soft and sticky. Usually this happens around midday and it is quite tough to ski when it happens. In the afternoon there is continuing softening which may sometimes produce conditions which strong skiers can enjoy. It can feel like skiing powder so long as you have good carving skills. Then the pistes will be smoothed by the groomers sometime after sunset, depending on how quickly the temperature is dropping, and the next day the cycle is repeated. 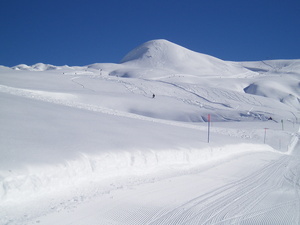 Off piste was ski-able on spring-snow. That means there was a thin crust strong enough to ski on. But it needed a very delicate touch to avoid breaking through. Avalanche risk was extremely high for the last few days and is still very high. Avoid steep slopes off piste whichever way they face and, although the snow-pack is becoming more stable after the last big dump, wet-snow slides will soon became a danger on sunny sloes in the afternoon. Read both the weather forecast and the avalanche bulletin. This year the Compagnie Mont Blanc is reeling under the impact of a catastrophic fire which destroyed the mid-station at Argentiere, multiple cable problems and the subsequent replacement costs, the deployment of the wonderful Russian heavy-lift helicopter (which can't be cheap), and the brutal fact that some race-teams have gone elsewhere to train. But the piste team is exceptional in Les Houches, as I've said before. We should never forget how much our enjoyment of the snow depends on the hard work and dedication of the piste team. 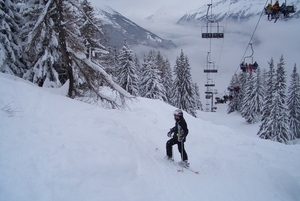 Although relatively low, Les Houches is deeply shaded in the early months of the season. In combination with extensive snow-making and excellent piste management this allows it to offer reliable skiing conditions which attract race teams and instructor-training groups. And it is part of the iconic Chamonix region of course. Les Houches has many mountain restaurants. If you have gourmet inclinations you may like to sample the charming Vieille Luges, the cool and stylish L'Hors Piste, both of which serve first-class food, while La Taniere has a wonderful atmosphere and a unique Argentinian buzz. A surprisingly large number of other mountain restaurants offer alternatives at lower cost. At the bottom of the lifts there is the quirky Kitch Inn near the Bellevue cable-car, and the friendly and traditional bar-cafe Le Spot is just across the road. At the Prarion lift Eric Jaquier's very professional boulangerie-patisserie has expanded to become a welcome cafe-bar. Perhaps arrive early and breakfast at one of these places before riding the first lift up to make the most of the best snow and the quietest pistes. It's a very effective tactic in busy periods like Christmas, half-term, and the Easter holidays. Finally, a reminder that the latest-style of lift passes can be re-used after paying online. This includes hands-free passes from other ski areas. They can all be re-charged for Chamonix or elsewhere by visiting the appropriate website. There is no discount given this way, but you will never have to queue at a ticket office again. A huge convenience at any time, and almost essential at peak periods. As the Resort Manager for Les Houches (working without pay for the world renowned snow-forecast.com) you might expect me to be biased. Fear not, while I am certainly corruptible the sad fact is that I have received no offers at all. Therefore my own opinions remain utterly objective. I write as someone who loves this place, is not blind to its shortcomings, but choose to spend the whole winter here as well as some of the summer. It's absolutely great, and I hope you come when the slopes are empty, the snow is in superb condition, and the weather perfect. But no promises; this is the mountains folks, and anything could happen. But, if you see a lonely old bloke nursing a coffee and a pastry at the Jacquier patisserie under the Prarion lift, say hello and make my day. And read my resort news. Which is really a snow report in disguise.